Dr. Ganz Ferrance holds a Ph.D. in Psychology. He has been in the business of helping individuals, couples, families and organizations reduce their stress, improve their relationships and enjoy more success for over 20 years. One of his first jobs was working with distressed and at risk youth in inner city Chicago. He has also worked in schools and other organizations in northern communities. Dr. Ferrance also appears regularly in the radio and television, as an expert relating to psychology. Dr. Ganz Ferrance is a favorite of the media and has had many interviews with The Edmonton Journal, CBC Radio, Good Morning Canada, and CTV News. He is has also been a regular “Health and Lifestyle” panel expert on Alberta Primetime for over three years and has been presenting a monthly segment on CTV’s Noon Show for the past seven years. He gets a kick out of seeing people be their best and presents his information in a straightforward, down-to-earth, no-nonsense way that he calls his “Tweed-free” approach to psychology. Dr. Ganz Ferrance holds a Ph.D. in Counseling Psychology and an M.A. in Developmental and Educational Psychology from Andrews University in Michigan. He is the former Public Education Coordinator as well as the former Vice-President of the Psychologist’s Association of Alberta. Dr. Ganz enjoys sharing how people can get more “mileage” from their lives. Dr. Ganz believes that we are all a work in progress and that true change takes place from the inside out. The change you and your team will experience under the support and objective guidance provided by Dr. Ganz and will result in a core change allowing you to live life functioning at your optimal level. Ganz Ferrance’s easygoing, friendly and humourous approach makes you fee at home, comfortable and trustworthy. 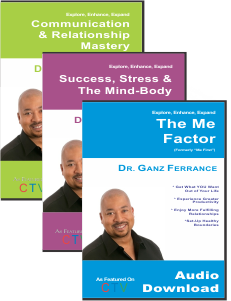 Dr. Ganz Ferrance is a dynamic researcher, coach and speaker. Dr. Ganz’s work goes beyond the keynote as he is committed to assisting others through his hard work and dedication in Psychology. He can present his topics in relation to health, cyber bullying, change management, resiliency, health & wellness, mental health, stress management, personal & professional growth, relationship management, parenting, workplace culture, healthcare and many other topics. Dr. Ganz Ferrance provides tailored keynotes and workshops to meet the desired learning outcomes of your audience. Dr. Ganz is a leading psychologist, researcher, and resource for multiple media outlets on countless topics. He uses his superior knowledge and experience in psychology to break down any current behaviour or social related problem. The change you and your team will experience through Dr. Ganz's Keynote or Workshop Presentations, will result in a core change guiding you to live life functioning at your optimal level. Dr. Ganz will take any relevant topic and draft a customized tailored presentation for your organization. Dr. Ganz helps many individuals and teams to reduce stress, increase performance & productivity, increase mental wellness, develop better working and family relationships, improve our communication methods and assess social risks or problematic behaviours within any work environment or social community. The playground and the locker room are not the only places you have to worry about bullying anymore. As you connect to technology, some of the advantages can turn into dark opportunities for people who feel powerless to try to bully others. There are things you can do to enjoy your phone, tablet or computer while protecting yourself (and/or your kids) from the hurting people who try to take their pain out on others. Dr. Ganz Ferrance is one of Alberta's top experts in Cyber-Bullying. In his interactive, entertaining and fun presentation. To Understand truth about bully’s and what we should do if one confronts us. Discover how to put technology to work for you instead of being a slave to it. Claim your independence and uniqueness so you can "fit in" by realizing that you do not have to "fit in" to succeed. Know how and what to say when you need to reach out for help. Become an expert in electronic etiquette so you will be more socially successful now and in the future. Masters have been revered for centuries. Whether your chosen field of pursuit is music, sculpting, business or martial arts, true mastery is mastery of self. Discover your greatest asset and expand your life. Unlock the hidden talent, knowledge and wisdom that you already possess so that you can go further and accomplish more. Harness the Power of Your "Secret Brain". Work less and Achieve More. Learn Faster and Adapt More Quickly. Have your Emotions Work with You Instead of Against You when the Pressure is On. Learn my number one secret towards enhancing communication, loving yourself and the people you chose to have around you and remember that happiness is a choice. In this keynote or workshop you will discover how to be far more effective at getting your point across and enjoying deeper relationships with others. Only you have the power to govern your actions and how people respond to you. Learn to master communications with colleagues, family and partnerships so that you can get the most out of each interaction. How to stop a Sudden Discussion with Your Partner from Suddenly Degenerating into Armageddon. How to avoid the 3 Most Common Mistakes People make when Communicating (and find out what to do instead). How to feel More Fully Understood and Understand Others Better. How to discover Your #1 Resource for Enjoying Better Relationships. How to understand Boundaries and How to Use Them. Good Communication is the Foundation of Healthy Relationships in all areas of Life. Yet, when it comes to communicating and getting along with others, most of us can tell when things aren’t working but have never been taught what to do instead. Let Dr. Ganz help you have the HEALTH, HAPPINESS, LOVE AND SUCCESS that you truly Deserve. If you are like the rest of us, you didn't receive the "Owner's Manual" when your child arrived in your life. The truth is that Parenting tends to be hit-and-miss, trial-and-error, on-the-job training that can seem overwhelming at times. Avoid the #1 Mistake Most People make When it Comes to Raising Their Children. Learn The Truth About Love, Discipline and Attachment. Take Back Your Authority as Parents. Master the Challenges of Blended Family and Shared Custody Parenting. This keynote or workshop is designed to help you make sense of this incredibly important task and provide you with valuable insights, techniques and approaches that will help you raise Happy, Healthy, Confident and Successful Kids no matter what stage of parenting (or grand-parenting) you find yourself in. Whoever said "It's all about me" was right! Who you are and your state of being has far-reaching and long-lasting consequences for everyone you hold dear. Taking care of yourself is essential to productivity, health and well-being for yourself as well as those you care about. Live with vitality and passion while experiencing amazing creativity and success. Learn the 6 essential areas that you need to look after in order to attain long-term success both at work and at home. Greater productivity, deeper intimacy and a more balanced life can be yours with Dr. Ganz's system that helps you truly Master your Potential. Get What YOU Want Out of Your Life. The strength of the foundation determines the strength of the building. Similarly, your Mind-Body foundation determines the dimensions of your Success, Health and Happiness in all areas of your life. Discover the truth about your personal foundation. How you function, what motivates you and how you can ultimately be more successful with less effort than you ever thought possible. Turbo-charge your energy and productivity with Dr. Ganz and Master your Potential! Discover the Zone and How to Stay There Longer. Harness your Intuition to Dramatically Improve Your Decision-Making Ability. Root Out the Hidden Beliefs and Habits that Hold You Back. Put Together Your Personal Success Team. This Presentation gives you practical exercises and support to help you bring back the joy, passion, energy and spark to your life instead of depleting your needs and yourself by placing everything and everyone else above your own. When you don't Feed the Goose, your life goes out of balance and your fulfillment and relationships go down the toilet. Avoid the #1 Mistake Most People make When it Comes to Raising Their Children. If you are like the rest of us, you didn't receive the "Owner's Manual" when your child arrived in your life. The truth is that Parenting tends to be hit-and-miss, trial-and-error, on-the-job training that can seem overwhelming at times. This audio workshop is designed to help you make sense of this incredibly important task and provide you with valuable insights, techniques and approches that will help you raise Happy, Healthy, Confident and Successful Kids no matter what stage of parenting (or grand-parenting) you find yourself in. Let Dr. Ganz help make your life easier as a parent while giving you and your kids the relationship success you both desire. - Learn The Truth About Love, Discipline and Attachment. - Take Back Your Authority as Parents. - Master the Challenges of Blended Family and Shared Custody Parenting. Some of the most frequent questions I get from clients is how they can get back to a life of happiness and abundance instead of one of sadness, depression and constant pain. To answer this, the most important question you could ever ask is "Is this working for me?" Our new new book, video series and Facebook live segments will show you how to get back on track with The Me Factor: Your Systematic Guide to Getting What the Hell you Want. Dr. Ganz is the best psychologist I have ever met. I have worked with over a dozen psychologists in the last 8 years and I have never seen results. Then I met Dr. Ganz. He is a subject matter expert, he is personable, his knowledge is very diverse, he goes above and beyond for his clients. I recommend him to everyone I know that could use his services and I always find his social media posts insightful and helpful. I have had the opportunity to see Dr. Ganz speak on a number of times, have watched him on television, and recently interviewed Ganz on my radio show. 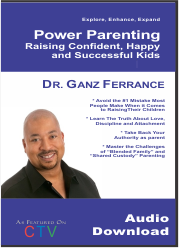 If you are looking for a radio guest or speaker to help people learn how to build stronger family relationships, manage and reduce stress, and live with more joy and purpose, I highly recommend Ganz!